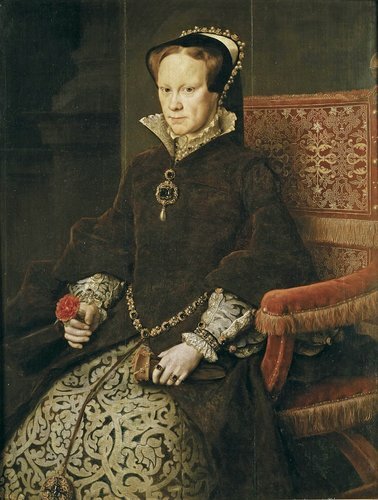 In July of 1554, Queen Mary I married Philip of Spain. The Queen was quite in love with her hunky new hubby. Unfortunately, many of her subjects didn’t share her affection, including Parliament who refused to recognize Philip as King on October 21, 1555. And this wasn’t the first or last time. Since Mary refused to abandon her mother and her religion to side with her father, Henry made her life a misery. Ultimately mother and daughter were separated and they were not even allowed to exchange letters. To add insult to injury, Mary was stripped of her royal status and forced to act as a lady-in-waiting to Anne Boleyn’s daughter Elizabeth. 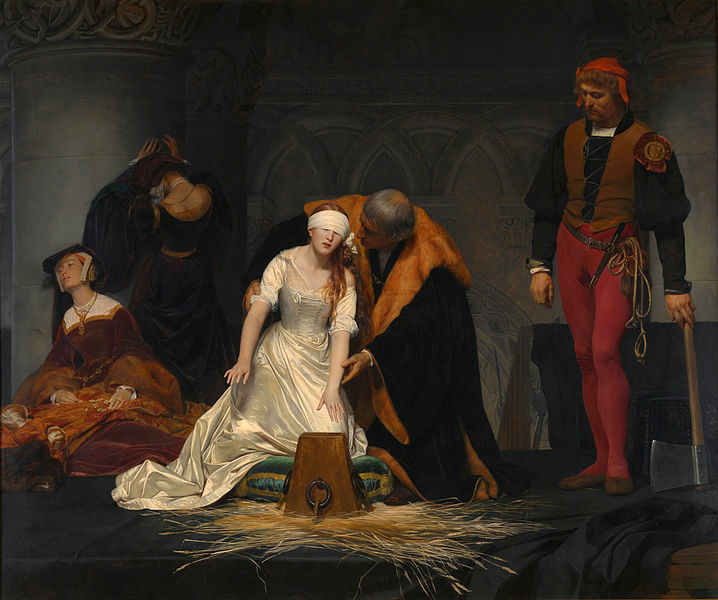 The good Duke soon found himself missing a head and Lady Jane was convicted of high treason, but then spared. However, this changed just a few months later with Wyatt’s rebellion of 1554 which Jane’s father and his two brothers took part. Although her part in her first “rebellion” against the true heir Mary was not exactly her doing, and she had nothing to do with the second rebellion that was put on her ledger, Jane nonetheless was convicted of treason and sentenced to death, losing her head in February of 1554, at the tender age of about 17. And so it was that Mary took the throne. As her deceased younger brother feared, she almost immediately set to work re-establishing Catholicism in England – no matter the cost. And, of course, as she was in her late 30s, finding a suitable Catholic husband to beget Catholic heirs with was a time sensitive need. 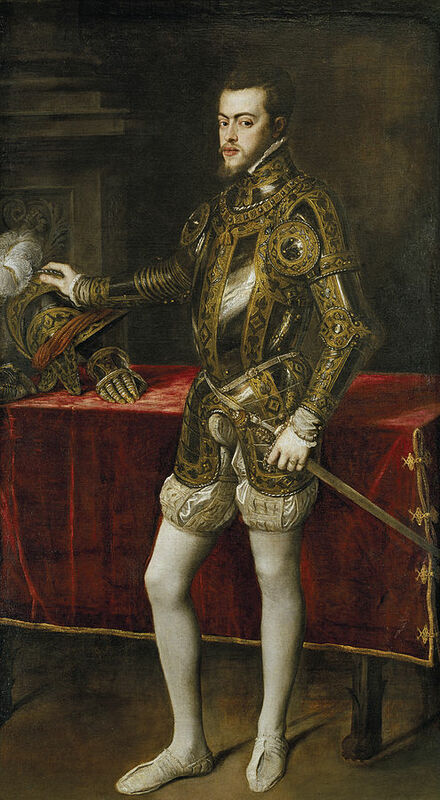 Although her council did their best to encourage the Queen to marry an Englishman, Mary insisted on marrying Philip, the son of her cousin Charles V. A staunch Catholic ten years her junior, for Philip this union was nothing more than a political alliance. On the other hand, Mary was seemingly genuinely smitten with the handsome Spaniard. Many in England were deeply distrustful of Philip and felt his presence spelt trouble for the Protestant cause. But Mary was reveling in her personal happiness and waited patiently for the signs of an heir in the making. While it’s possible there was a miscarriage that was just never publicly divulged for some odd reason, most historians think this was simply an example of a False Pregnancy. Whatever the case, Mary wasn’t happy about this, and knowing Philip was embroiled in numerous affairs in England and abroad did little to improve her flagging spirits. It seems that Mary may have funneled her frustration at her inability to have a child into religious fanaticism, blaming the loss of her supposed baby on God punishing her for not doing enough to rid England of heretics. She continued executing Protestants left and right; all total during her five year reign it’s thought that nearly 300 religious dissenters were burned at the stake. Matters were not improved when her husband left for a couple years to deal with pressing issues in the Low Countries, leaving the near 40 year old Queen, who no doubt could hear her biological clock ticking a mile away at this point, to fend for herself in England. Philip returned in March of 1557 to raise English troops for the war, and by July he was off and running again. However, almost immediately after his return, Mary believed herself pregnant again, but as before no royal infant appeared by the following spring and the bereft Queen had to face the hard fact that she’d probably never have a child. She sank into a deep depression from which she never recovered, dying on November 17, 1558 during a flu epidemic at the age of 42. Philip wasn’t in England when she passed away. After being informed of his wife’s death, he wrote in a letter to his sister, “I felt a reasonable regret for her death.” Now, that’s romance. When Mary died, her half-sister Elizabeth ascended the throne and Philip wasted no time reminding her that he was now back in the marriage market, and had more experience than anyone alive at being married to a Queen of England. The new Queen Elizabeth I, who was busy switching the country back to Protestant after the brief reign of her Catholic sister, wasn’t interested. So, what was “The Game”? OH! I can’t believe I didn’t get that! I enjoyed this article. I must say though, Phillip’s codpiece is kind of gross. I can’t believe men actually used to dress like that.